Attitudes to being asked to write a review are changing all the time - for the better: consumers now mostly understand that reviews are part-and-parcel of the modern business landscape - and that they need them as much as we do! If your business has massive footfall - a 1000 bed hotel, a large online shopping site - you can probably risk reading no further. But if you are a high value/low customer turnover business - legal, financial services, estate agency - you should read on. Take estate agents: it is not unusual for a single branch, especially in pure sales, to have transactions in single figures per month. For that kind of business it is essential that every opportunity is taken to maximise the chances of a review being written, both to their own website and to Google. It is as simple as that. And it is being consistently achieved by clients who follow these guidelines. Bear in mind that if they really don't want to/or physically or mentally cannot bring themselves to - then they simply fall into the 50% who we expect not to anyway - don't harass them! For more on the customer journey, from initial search to enquiry, read this. And for those of you who like graphics: here's a really helpful - and up-to-date (attitudes to review writing continue to change for the better) infographic from ReviewInc. This chart usefully backs up our rule of 50%. 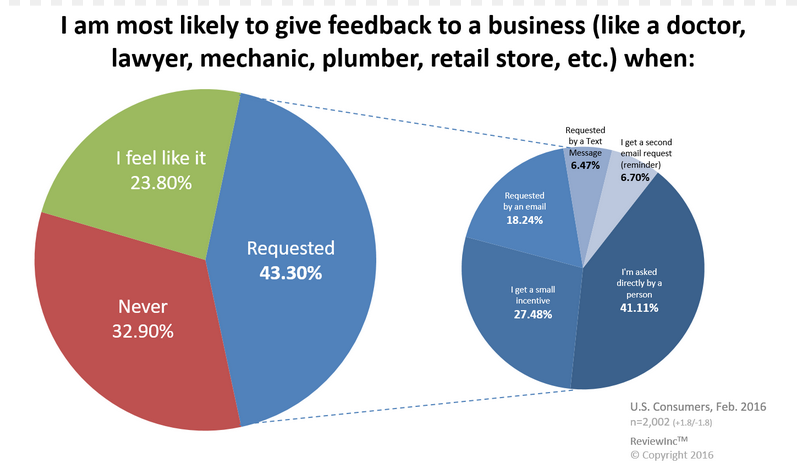 It shows that most people - certainly more than 50% - are happy to write a review is they are a) asked in the right way and b) that request is reinforced personally, face-to-face or by phone. So: aim high and you will achieve the results you need.